Here is the story of Gertrude Bell, who explored, mapped, and excavated the Arab world throughout the early twentieth century. 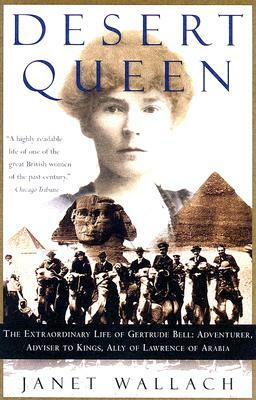 Recruited by British intelligence during World War I, she played a crucial role in obtaining the loyalty of Arab leaders, and her connections and information provided the brains to match T. E. Lawrence's brawn. After the war, she played a major role in creating the modern Middle East and was, at the time, considered the most powerful woman in the British Empire. In this masterful biography, Janet Wallach shows us the woman behind these achievements–a woman whose passion and defiant independence were at odds with the confined and custom-bound England she left behind. Too long eclipsed by Lawrence, Gertrude Bell emerges at last in her own right as a vital player on the stage of modern history, and as a woman whose life was both a heartbreaking story and a grand adventure. Janet Wallach is the author of The Richest Woman in America: Hetty Green in the Gilded Age, as well as Seraglio and Chanel: Her Style and Her Life. She is also coauthor, with her husband John Wallach, of three previous books on the Middle East: The New Palestinians; Arafat: In the Eyes of the Beholder; and Still Small Voices: The Real Heroes of the Arab-Israeli Conflict. She lives in New York City.